Once the software is installed, download MSVCR70.DLL and put it in the VCS directory (C:\Program Files (x86)\VERITAS\Cluster Manager\bin\). Then run "Veritas VCS Simulator - Java Console" and "Veritas Cluster Manager - Java Console" as Administrator (Right Click - Run as Administrator) and unblock the Windows Firewall ports (allow exception). 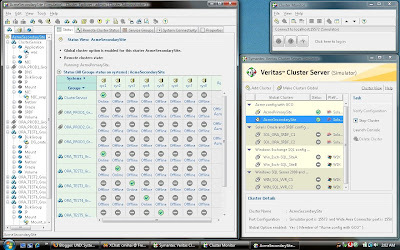 Enjoy playing with Veritas clusters :-).